What's better than an elite bodybuilder explaining his chest routine? How about two IFBB pros training together and discussing their pec-growth secrets! Join Evan Centopani and Frank McGrath as they push through the B.S. and talk about what works. Which body part most separates world-class bodybuilders from the rest of us? If you encounter these giants only through their training videos, you might say legs or arms. But once you meet them in person, you'll see that it's really their chests. Whether they're shirtless onstage or filling out an iconic yellow T-shirt , there's nothing quite like a barrel-sized torso to make a man truly seem larger than life. Two of the biggest out there belong to IFBB pros and Animal athletes Evan "Ox" Centopani and Frank "Wrath" McGrath. Both have been pros long enough to have tried every technique in the book and zeroed in on what works best for them. Recently, these two old friends met up at Ox's home turf, Powerhouse Gym in New Haven, to train together and compare notes about their go-to techniques and their fondness for the classics. How do you warm up for a chest workout? Ox: We started this workout with some cable crossovers. Wrath: I'd never done that before. Ox: Get outta here. You never warm up? Wrath: Well, when I warm up, it's light. (They were using the whole stack). It was good, though. I liked it. I don't have some great methodology behind my training. I just pick up some weight and push. Ox: Yeah, it's tough to warm up, because once you get going, you want to get a little more blood in there. I don't know about you, but as I've gotten older ... you know how it was when you were younger, you'd just go in and go put four plates on the bench and go "I'm ready, let's go!" It doesn't happen anymore. Even though the weight we used on the second movement, which was a pressing movement, was slightly decreased, I think it was a little safer, and we got more out of the [second] movement. Wrath: I like to do incline first. I think I have a good lower chest, but I'm really trying to work my upper chest. I used to get more injuries doing flat bench than incline. I never had a problem with incline. Ox: A lot of guys say that. I agree that incline is safer. The reason I shy away from the incline is because my shoulders have a tendency to take over. If I had to pick, I'd say incline is safer, but I feel I get a little bit more out of the flat bench. Either way, you can't lose. I save flys for last. I'll almost always do a press first. I thought that was the rule! Wrath: Just mix it up. You can't do the same thing every single time. Ox: Sometimes I do both. People say "Why would you do two barbell pressing movements in one workout?" I say, "Why not?" 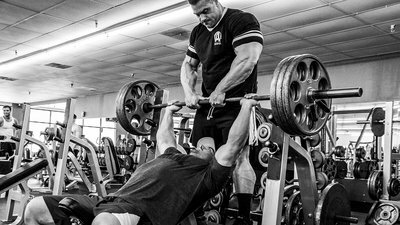 What's your overall approach to chest training? Ox: I don't have some great methodology behind my training. I just pick up some weight and push. Wrath: There are a lot of new ways to train, but everything is just the same to me. There's nothing better coming along than dropsets and supersets. Ox: Any way you can overload the muscle is what it's about. There are a lot of gimmicks. People ask "Why did you do this workout like this?" I don't know. I just worked my way up to a weight that's heavy for me, and I tried to do that weight as many times as I could. If I wanted to throw in something else, I'd have someone there for forced reps, dropsets, supersets, things like that. There are ways to beat it up more. Wrath: It's pretty basic. Some days, when I can't go as heavy, I do more dropsets and stuff. I'll do incline on days when I don't feel so strong, and I'll do three plates, drop to two, get as many as I can get, drop down to one, and get as many as I can get. How do you structure your chest day? Ox: Today we started off with a fly-type movement. Then we did two pressing movements, and ended off with another fly. A lot of guys save flys for last. Wrath: I save flys for last. I'll almost always do a press first. I thought that was the rule! Some days, I'll do a fly next. Some days, I'll do incline bench and then flat bench. But on days when I don't feel like doing flat bench, then I'll do a fly or machine press. I'll do that just to get a better squeeze. Sometimes it's good to be at a gym away from home, where it doesn't have all your usual equipment. It forces you to do something else. Do you use a lot of machines? Wrath: I always do some, but not all. Even if something is hard to do, I'll still do it. Ox: You've had a couple injuries now. Wrath: Yeah, even anything with dumbbells are pretty hard for me, but I try. I think that if I stay away from it too much, it's not going to make it any better. I try to do the most I can with dumbbells or anything that causes ... not pain, but that's harder than it used to be. Wrath: I used to be stubborn before. I was like, "I'm strong; I can do it." And then I've had people who've pretty much lifted it out of my hands. It's like you're not even holding it anymore. Wrath: I'd trust someone like you—I wouldn't even think about it. But if there was nobody there I trusted, I wouldn't do it. Ox: I liken it to a 2-1/2 hour car ride. I'll drive the whole way with no A/C, only because when I put the A/C on and I get out of the car, I hate that shock of the heat hitting me. If I drive the whole way and it's hot, then I don't feel it when I get out. It's the same thing with a liftoff. I hate when someone lifts it off, because all of a sudden I feel the weight. I'd rather feel it the whole way and know what I'm in for. What do you do when your favorite equipment isn't an option? Ox: Sometimes it's good to be at a gym away from home, where it doesn't have all your usual equipment. It forces you to do something else. Even if it's a piece where I'll look at it and go, "Uh, it's kinda cheesy. I'm not into that." I've had good workouts, even when I'm traveling and it's a real fluff gym. You never know—today being a prime example: There was no plate-loaded Hammer Strength press, so we just used the stack one. Honestly, it was deceivingly heavy. Wrath: What was it, 90 pounds? Ox: Yeah, 90 pounds on each side and it was heavy. It was different. Would I use it every week? No. Is it a bread and butter movement? Definitely not. What are your favorite finishers? Ox: The superset we ended with is one I really like: dumbbell flys superset with dips. I love dips. My first weight bench had the post you could take out and bring them in narrow. You did dips off the back of it. I used to go to town on those. To this day, I consider dips one of the best upper body movements. We were talking about it at the end of the workout. Frank was like, 'You like push-ups too, right?' I was like, "Yeah!" People make fun of me for doing them, but push-ups are a great movement. So are dips. All those bodyweight movements. Wrath: I've had guys come up to me in the gym when I'm doing push-ups, and these guys have been around for a long time, and they're like, "What are you doing? You're going to get big doing push-ups?" At the end of a workout, dude, push-ups are like a flat bench. Ox: Absolutely. It's a perfect feel. One is a fly movement, the other a pressing movement. It finishes everything off. Start lighter with higher reps, then add weight and lower reps.